The new Pulte Family Life Center at St. John the Evangelist Parish in Naples was dedicated and blessed by Bishop Frank J. Dewane on March 16. The building is dedicated to the memory of Bill Pulte, a builder of homes who passed away in 2018. Representatives of the Pulte family were present for the ceremony and led the ribbon-cutting. 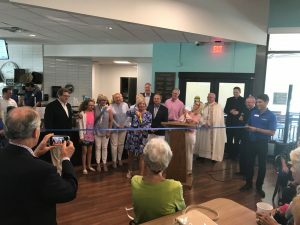 Bob Pulte, Bill’s son, said the legacy left behind by the Family Life Center is something the Parish community will use and enjoy for years to come. “Please know what this place and this community meant to my father,” Bob Pulte said. Bishop Dewane described the Pulte Family Life Center as a place where all will come to know the presence of Christ, to experience friendship and joy, and to grow in Christ’s love. 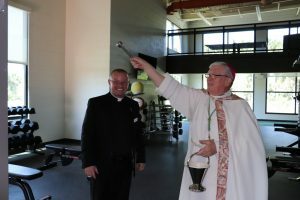 Following the dedication ceremony, the Bishop, joined by St. John the Evangelist Parish Pastor Father Tomasz Zalewski, blessed the building with holy water. The Center is 29,277 square-feet and encompasses a café, two fitness rooms, a gym with courts for basketball, volleyball and more, as well as a community room that can be subdivided. In addition, there are offices and maintenance areas. There is also a playground and two bocce ball courts. The front lobby has a large cross and a quote from St. Ignatius of Loyola: “Teach us to give and not count the cost.” The facility was designed by Studio+ Architects and the construction done by Gates Construction. This new space is home to the growing Catholic Youth Organization – which focuses on engaging younger parishioners; and the new Catholic Adult Organization which is a set of programs to enrich and engage every age of adult, from 18 to 118, in body, mind, soul, and spirit. Following the blessing, the Bishop celebrated the Mass in the gym, which is serving as a temporary overflow worship space while hurricane repairs on the Parish Church continue.